The Yakima OffGrid Rooftop Cargo Basket was first announced by Yakima in the summer of 2017. The original release time frame was Fall, notably October, of 2017. This did not happen. 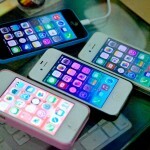 In fact, it was not available to acquire until late August 2018. I pre-ordered one from REI during Memorial Day 2018 and did not get it in my hands until recently. I’ve installed it and had an opportunity to drive around with it. 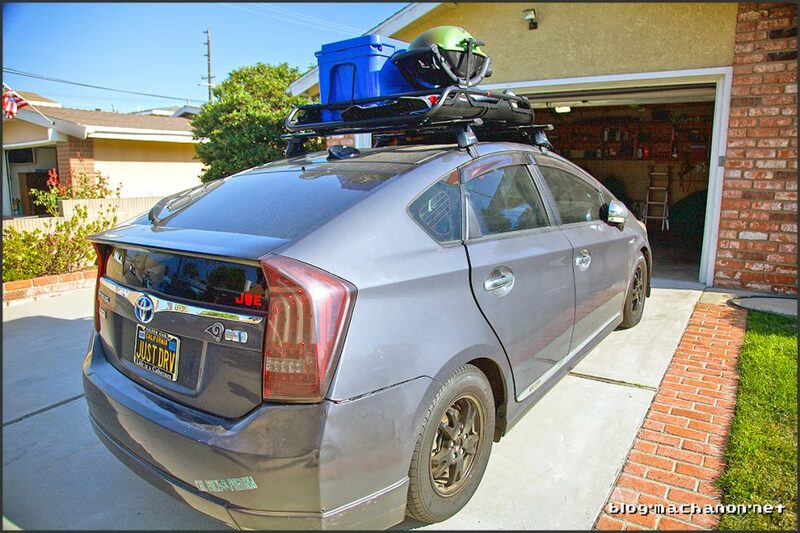 Continue reading to see how the new Yakima OffGrid fits and looks on a 3rd generation Prius. The Yakima OffGrid Rooftop Cargo Basket is an updated version of the Yakima LoadWarrior Rooftop Cargo Basket. It can also utilize side clamps (Yakima TopGrip OG #8007355) to transport long hand tools, including a paddle. The LoadWarrior Stretch Net used to keep loaded content safe and secure is also compatible with the new OffGrid. New features that differentiate the OffGrid from the LoadWarrior is its sleek and modern, aerodynamic characteristics. Included with the OffGrid are new optional adjustable accessory bars. These optional accessory bars can clamp down on larger, bulkier items, such as a luggage or a cooler. 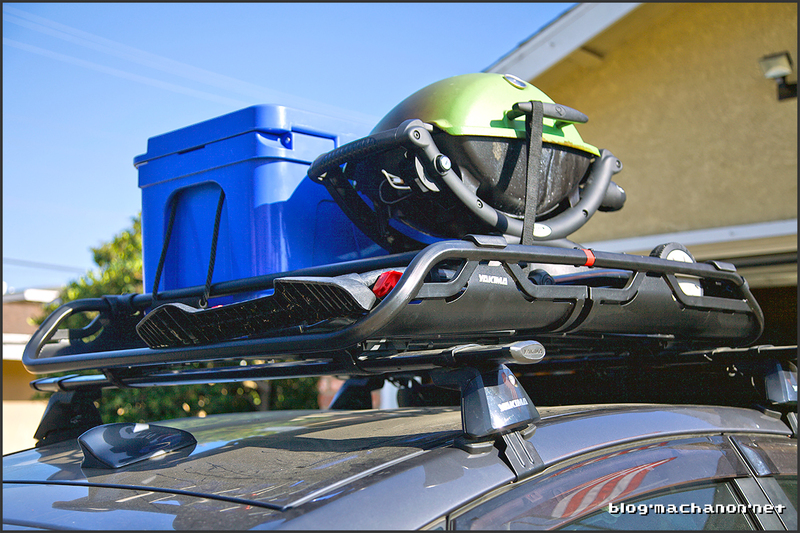 Alternatively, they act as crossbars to carry bikes, skis or kayaks within load capacity. The fairing is now completely removable when transporting longer items in the OffGrid. Finally, the four mounting clamps on the OffGrid uses rubber coated steel straps that wrap around the crossbar to secure. 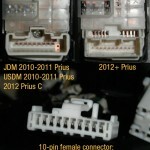 These four clamps also include installation port for optional SKS keys. The LoadWarrior requires the purchase of replacement brackets in addition to SKS locks to properly lock the rooftop basket setup. Similar to the LoadWarrior, an optional extension kit that adds up to 40% more capacity is available for the OffGrid. Available in two sizes, medium 18” or large 22”. 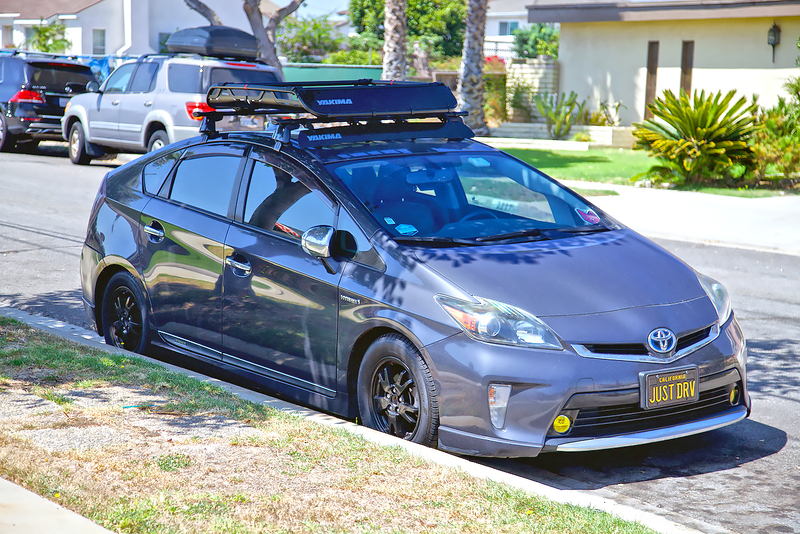 The Yakima OffGrid rooftop cargo basket was installed on a 2012 Toyota Prius with Yakima BaseLine towers and 50″ CoreBars. The sleek aerodynamic looks of the OffGrid is definitely more visually appealing than the boxy LoadWarrior. Because of its aerodynamic curvature, the side walls of the Yakima OffGrid curves inward, sacrificing a small amount of real estate. Not really a problem for small ticket items, items with a cylindrical shape in nature or items with no defined shape, such as a bag or a foldable camping chair. But with a full basket filled with larger defined items, as with our Weber Q1200 gas grill cart, the curved side wall pushes the grill stand inward towards the center, slightly tilting the grill stand to make up for the missing real estate. Installation was a breeze and took no more than 45 minutes from assembly to finally securing onto the rack system. The OffGrid weighs only 38 lbs and can be lifted onto the crossbars by one person. The sleek aerodynamic characteristics of the OffGrid gives it a modern look compared to the boxy style of the LoadWarrior. I did notice a few minor issues with the quality. For example, the rubber feet on the clamp blocks of the accessory bars peeled off when I mounted them for the first time. Also, one of the red coupler did not 100% align with the front-end of the basket, resulting in an arched basket. This was fixed with a rubber mallet and manual labor. The security hex nut used to mount the accessory bars onto the basket is annoying to use and easy to lose, but I can appreciate its purpose. Overall, the OffGrid is a pretty well built rooftop cargo basket despite minor quality annoyances. The adjustable accessory bars are definitely a step up compared to the stationary basket design of the LoadWarrior. The LoadWarrior has one built-in retaining horizontal bar at the back of the basket, whereas the new OffGrid has no retaining bar. Where the accessory bar is installed defines the retaining bar. I used both bars to clamp down on a 26.5″ long cooler and our Weber Q1200 gas grill and cart. The gas grill cart measures about 38″ collapsed and the front end of it extended passed the length of the OffGrid. To accommodate this, I installed the accessory bars over the collapsed cart. Not only did the cart fit in the OffGrid, but the accessory bars clampped down on the cart at the wheels and at the front. With a Stretch Net over, the content is not going anywhere. The Stretch Net works with the OffGrid and I highly recommend using it when carrying loads in the OffGrid. The Stretch Net terminates in a series of double-sided hooks. One large hook that clamps onto larger support bars and a smaller hook that clamps onto smaller round bars. Note that the taller the content inside the rooftop cargo basket is, the harder it is to wrap the net around. In these cases, you may need a second set of hands and a step stool for access. While the OffGrid rooftop cargo basket has endless use, I find it most appropriate for transporting camping and outdoor gears. We have a SkyBox Carbonite 16 and we use it to its maximum potential on many road trips. Recently, we’ve been going on road trips that allows us to enjoy outdoor activities, e.g. grilling, kayaking, fishing and hiking. We transport one of our coolers with us when we go on these type of road trips. Unfortunately, the cooler takes up between 1/2 to 2/3 of the trunk space, forcing us to utilize the SkyBox for baggage and other items. With the new basket, we can now transport not only our cooler (Grizzly 60, 38 qt. Igloo or Ice Vault 50L by Blue Coolers) but we can also transport our Weber Q 1200 portable gas grill with its stand, and in addition to any combination of foldable camping chairs, travel stroller, toddler backpack carrier or beach tent. If we intend to carry any combination of these items in one sitting, we would need to strap the content down with tie-down straps in addition to covering the basket with Yakima’s medium Stretch Net. The adjustable accessory bars are positioned to pin down large ticket items, such as our cooler, snugly in place. If you have additional Yakima gear mounts, such as kayak, skis or bike mounts, you can install them onto the optional accessory bars and load additional gears on top of the OffGrid as long as there is clearance. 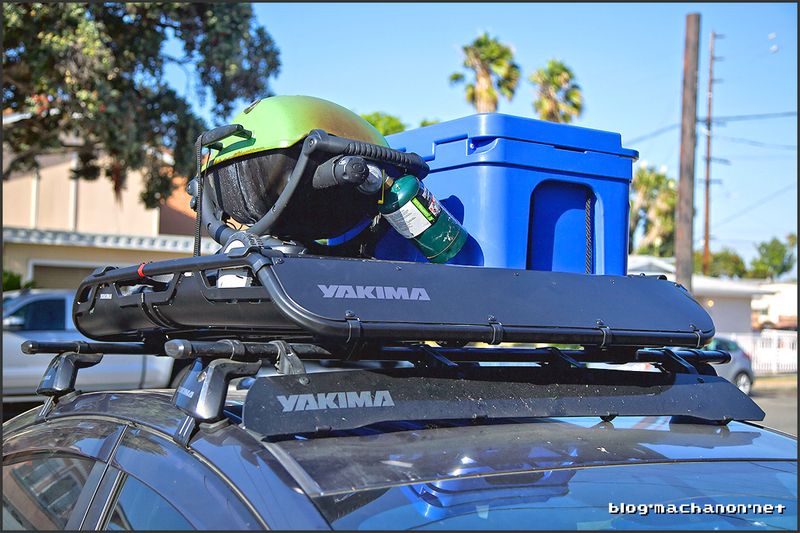 As with the LoadWarrior and MegaWarrior, the OffGrid can utilize the Yakima TopGrip OG basket side mounting brackets to hold a single tool with long hand, such as an axe or a paddle. I may look into modifying these brackets to accommodate one-piece 6′ or longer size fishing poles.